The Inspiration Lectern, from Spectrum Industries The What: Spectrum Industries has redesigned its Inspiration Lectern. The What Else: The Inspiration Lectern can be ordered in 36 or 42-inch heights to accommodate nearly any setting, and can be specified in many different configurations to suit customers’ needs. The Inspiration Plus Lectern can now be ordered in the company’s Spectrum Expressions line of laminate and metal colors, which are designed to match the furniture to a room’s décor. The metal colors provide a tough, wear-resistant finish to metal parts. The laminates cover all work surfaces and the matching vinyl edge trim provides the appearance of elegant, custom-built furniture. The Inspiration Plus Lectern is designed, assembled, and shipped from Spectrum’s factory in Chippewa Falls, WI. It is warranted to be free of all defects in materials and workmanship for 10 years. The Bottom Line: Small, lightweight, and versatile, the Inspiration Plus is well suited for situations when space and budget are at a premium. The design allows the presenter to be seated and still have leg room under the work surface. 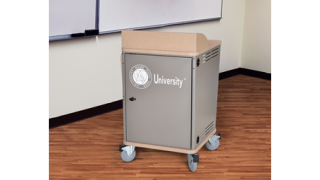 The lectern also features add-on options including custom-logo panel door, keyboard tray, surround or overbridge work surface, flip-up shelves, side table, and presenter side door.